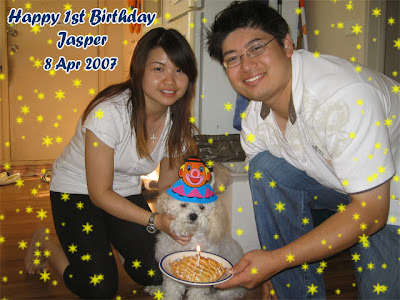 So fast it has already a year, when i saw the title it did reminds me the same month of last year which was the time i went back to aus so happily and few days later jasper was "born" in south 9. *sigh* how time flies. yah, it feels like so 'yesterday. Ever since i came back to malaysian, i haven't been baking anything. Miss those cheese cakes and siew pao also,not to brag, i think my cheese cakes and siew pao taste better than those i've tried out there, hehehe. Aiyoooo *thick skin*, but it's true la, your pastry and cakes are really hot stuff, to stop baking is such a waste. End year you come back visit, stay longer la, then can bake for us to eat again.. heeeee..